Toogooloowa 4 is a North East facing 2 bedroom first floor large stylish eclectic and sunny apartment with a blend of contemporary, ethnic and antique furniture to complement modern fittings appliances and services. Large double glazed windows frame the spectacular views to Mount Wellington and Hobart city and provide a warm light filled environment with plenty of room to accommodate up to 6 people. Bedroom 1 has luxury king size bed which can on request be separated to make comfortable twin beds. Bedroom 2 has a very comfortable queen bed and antique wardrobe. The large enclosed veranda has lots of space for 2 comfortable roll out single futon chair beds. To keep things cozy the apartment has a modern gas log fire, double glazing for an even temperature & noise reduction. To relax the apartment has a 37" High def LCD TV with DVD player. Facilities in the large fully equipped kitchen include ceramic cook top, oven, dishwasher and full sized refrigerator. There is an onsite laundry and one car park available for guests. Complimentary welcoming first morning light breakfast pack including Coffee, Tea, Cereal, milk and bread and spreads, as well as eggs from our free range heritage hens while they are laying, provided. Toogooloowa is superbly located at the quiet end of Davey Street with an easy 1.8 km walk down to the Hobart CBD, Salamanca and the waterfront or to the University of Tas. This apartment occupies the upper floor on the Northern side of Toogoolowa a beautiful heritage listed Victorian mansion which surrounds the original colonial 2 room cottage built as the first dwelling in the area during the early 1800s and the Georgian extension that was built over and around the cottage some years later. Visitors are welcome to smell the roses and relax in the huge overgrown wild garden with splendid views to Mount Wellington at the rear of Toogooloowa. 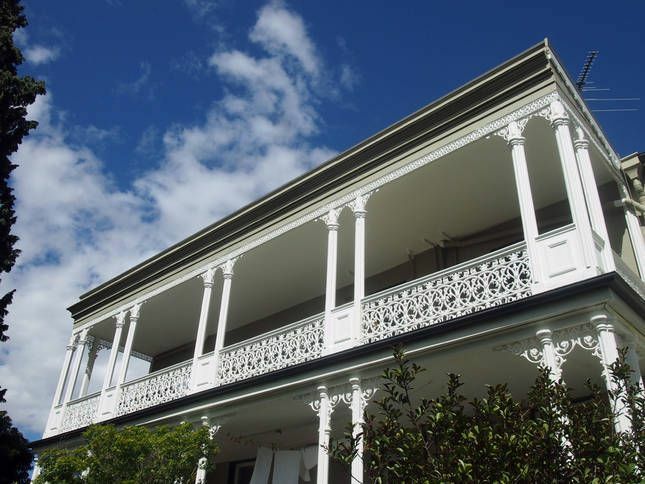 Apartment 4 has exclusive use of the large upper Victorian veranda with splendid views to Mt Wellington and the city. This is a great apartment, with beautiful views of the mountain. We had three kids staying, and they had a ball with plenty of room to play. The hosts were great to communicate with and really quick in their responses. I recommend staying here. Lovely heritage house with apartments. We loved this apartment in a lovely old neighborhood. No car and we managed fine with buses. Warm welcome, perfect stay and a lot of goodies provided in the pantry and fridge. Thank you, it was a pleasure to have you stay with us. We loved staying at this unique and spacious apartment. Close to the city centre, and all other Hobart attractions. Large and spacious apartment with a well appointed kitchen. Thank you. We loved having you stay with us. Very Nice and cousy. Good location. Spacy. Nice and helpful hosts. It's great to be able to help make your stay in Hobart comfortable. Apartment 4 is large, comfortable and well equipped. Within easy walking distance to the town centre and there is a fabulous fruit/veg/deli type store just around the corner. The owners live on site and are obliging and friendly. A little more attention to some minor details would improve the experience, (these were brought to the attention of the owners) but overall I would definitely recommend this property.